Marshall is the only choice for serious musicians. Nothing compares to Marshall cabinets in terms of awesome tone and projection. Both visually and aurally, Marshall 4x12 cabs are indeed "the business." Great sound and looks however are not everything. Many years of experience mean that their speaker cabinets are also built to stand the test of time. Highly skilled craftsmen construct them from the finest quality materials with precision corner locked joints, tough cotton backed PVC covering, heavy-duty hardware, and the highest quality fittings. If one thing personifies the image of rock 'n' roll more than anything else it's the Marshall 4x12. Though often imitated, nothing compares with the original. The first 4x12 cab was designed and built by Jim Marshall in 1962. Since then Marshall has made many thousands, which have appeared on stages both large and small all over the world. 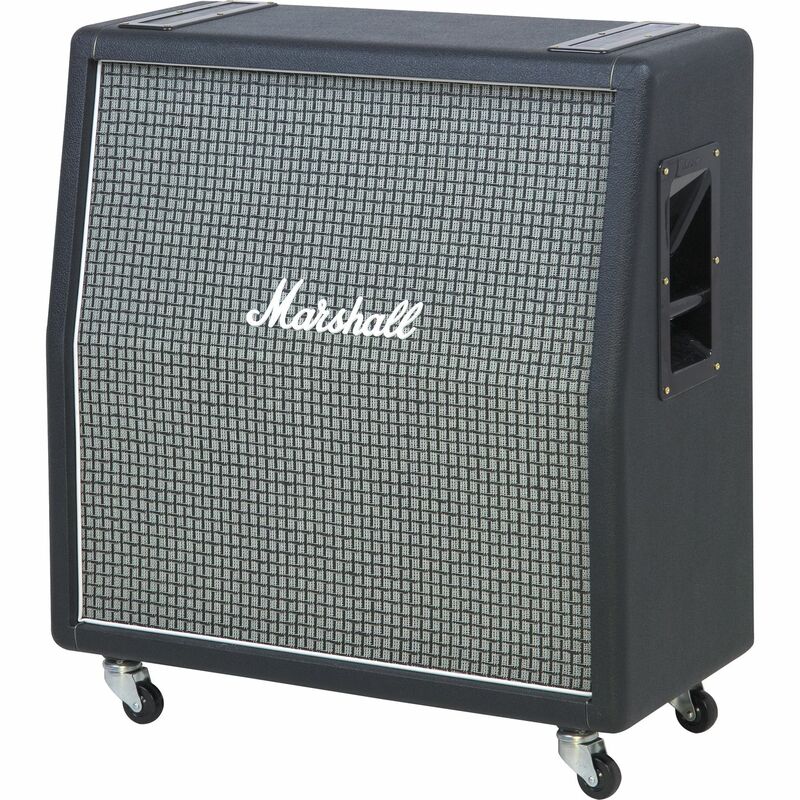 After the initial success of the Marshall 4x12, it wasn't too long before they designed and built the first stack, where an angled cabinet sits on top of a straight fronted cab, with the amplifier placed on top. This came about after discussions with Pete Townshend of The Who. Pete and Jim Marshall sat down and discussed The Who's requirements for an 8x12 cab with an angled top. This was designed and built, but due to this awesome cab being somewhat cumbersome, only six were ever made. As a result, Marshall came up with the more practical idea of stacking an angled cab on top of a straight fronted model. Thus the famous Marshall stack was born. What happened to the six 8x12 cabs you ask? Well, 2 went to Pete Townshend, 2 went to John Entwhistle and the remaining 2 went to the Small Faces. The Marshall stack on the other hand has stayed in production ever since and has gone on to become the most recognizable rock 'n' roll icon. As Marshall invented the stack, Marshall 4x12's are the only true originals. Everything else is merely an imitation. Heavy-duty castors are fitted as standard to all Marshall full size 4x12's to ensure that these cabinets are ready to roll without rocking. No sharp metal edges or rough fittings - the smooth ABS plastic Marshall corner fits perfectly and offers excellent protection to all eight cabinet corners. The highest quality woodwork includes the 'corner locking' of each and every joint. This helps give Marshall cabinets the incredible strength and durability, which has become as legendary as the Marshall sound itself. Heavy-duty Grab Handles are fitted to all Marshall cabinets. Their tough, ergonomic recessed casing design gives easy access to the bar of the handle without affecting the cabinet's smooth lines.